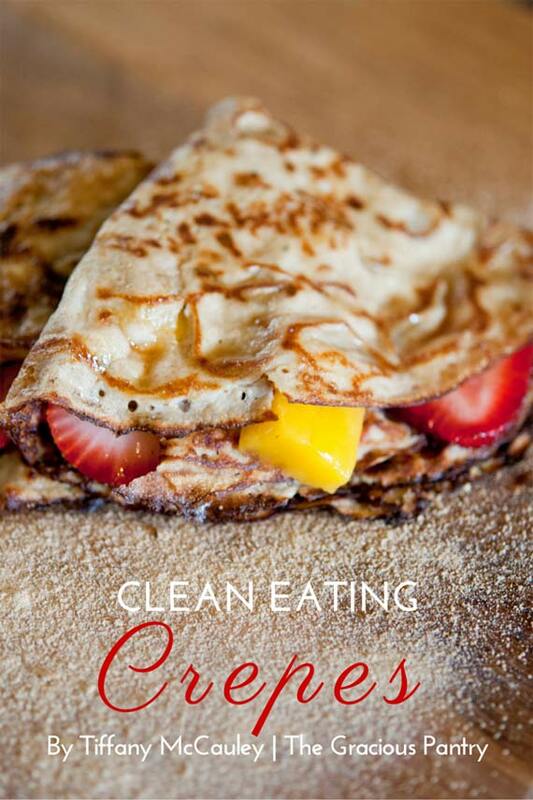 These clean eating crepes are the perfect special-occasion breakfast! My son is developing quite the palate. He comes by it honestly, but some days, it’s interesting to try and keep up with his developing tastes. Normally, we are a pancake or waffle household. I love waffles simply because I can make a big batch for freezing and then just pop them in the toaster in the morning for a quick breakfast. Especially topped with peanut butter. Yum! But this past weekend, he decided that wasn’t good enough anymore, and suddenly crepes were the only thing that would do. It’s not a bad thing since I’ve been meaning to do a basic crepe recipe for a while now. But he and I are going to have to do a crash course in the kitchen so he can satisfy his own, “shee-shee” cravings on demand. Thank goodness I taught him to eat clean because if he was craving the regular versions, The poor kid would be far less healthy than his current, vibrant condition. But on the other hand, I have a kid that eats well. And that’s saying something! A delicious breakfast for any special occasion! In a large mixing bowl, whisk together everything except the Sucanat (that's just for topping). The trick with crepes is to keep them thin. These are not pancakes. They should be about the thickness of a tortilla. Ladle some batter slowly into an oiled, non-stick pan. Rotate the pan to get the batter to spread thinly over the entire base of the skillet. Cook on low to medium heat, flipping as needed until cooked. 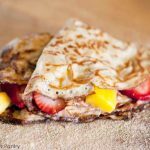 Place the cooked crepe on a plate, add your favorite fillings, and either roll them up like a burrito or fold them into quarters. Sprinkle with a little powdered Sucanat and enjoy! Lorrie – Fresh fruit is always a winner. 100% fruit spread, or even something savory like sautéed mushrooms and cheese. Thank you, Tiffany, for sharing this fantastic recipe. My boyfriend and I just purchased a home and there has been quite a lot of fixing up to do. Long story short, since I am not that handy with house repairs, I like to surprise him with home made meals, especially breakfast, and I like to use clean eating recipes to make sure only the best ingredients are fueling him through the day. One day, I decided to surprise him with this crepe recipes. I had honey and fruit ready for him to top them off with, but he refused to add anything and simply enjoyed them completely plain. Thank you again, you’re crepes were quite a hit. Elizabeth – Wow! Consider me flattered! 😀 So happy you both enjoyed them! thank you for posting! I’m a huge fan of your page. I’m wondering if you have the nutritional information for this recipe? Jenn – Sorry, I’m having to go through all my recipes and remove the nutrition data due to liability. But MyFitnessPal has a great calculator. All you have to do is enter the url of the recipe and it imports the entire ingredient list for you. Hope that helps! Hi! This recipe sounds amazing! Just wondering if its possible to make the batter (or the fully cooked crepe) and either freeze or store it (recommended length?). Love your website and your meal planner! Thanks for doing what you do so well!! Kate – Thanks! Happy I can be helpful! You could store the batter in the fridge for up to 3 days. I don’t recommend freezing it. The cooked crepes can be frozen, although I highly recommend putting parchment in between them so you don’t end up with a solid, frozen brick. Just be sure you wrap them well.